This site catalogs all versions of Carpenters songs along with the great bulk of their albums and compilations, including their later solo works. Differences in the mixes were determined through hours-long listening sessions. Each song was directly compared with all other iterations of that song on the many albums and compilations, using headphones to note shifts in stereo placement and to hear hard-to-notice details that can easily be overlooked. The general focus of this site centers around releases on vinyl and Compact Disc and considers those formats definitive. There were, of course, other formats out there that got official releases too, such as cassettes, 8-tracks, reel-to-reel, minidisc, etc., that might present albums in different track orders that have generally not been considered, except where noted in unique cases such as Quadraphonic tapes. This site sticks to official sanctioned releases on genuine A&M Records and their worldwide affiliates and distribution arms. Bootlegs, counterfeits, and gray market releases have been ignored. Billboard data is presented for each charting single, listing peak position and the date the song first appeared on the chart. All Billboard chart data is of course © Billboard Magazine. First, I must acknowledge the A&M Corner website, our fearless leader Rudy, and our many members for being there since the mid-’90s as a fountain of knowledge of all things A&M and Carpenters in particular. 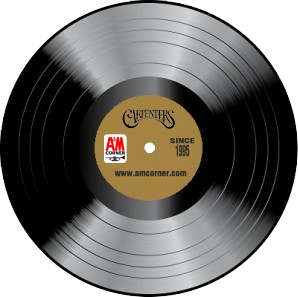 I must also thank A&M Corner member “davidgra” whose own website blazed the trail and has been the go-to website for Carpenters recording information for many years, and continues to be a valuable information resource. I’d be remiss if I didn’t acknowledge Internet pal and great Carpenters fan “Rick-An Ordinary Fool” whose dedication to tracking down those elusive mono singles turned out to be informative and inspiring. Though I’ve not delved personally too far into the quadraphonic releases, thankfully Jon Urban has shared his valuable information so I could include it here. Of course, a big thank you to member Chris May, whose connections in the industry and musical insights were of great value in helping to determine which mix was which.